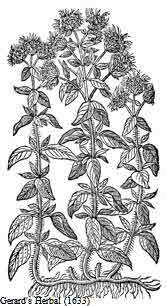 Marjoram is the name used for several aromatic perennial herbs of the genus Origanum, used as a culinary herb. Sweet Marjoram, Origanum hortensis, has a relatively mild flavor. Wild Marjoram, Origanum vulgare, is commonly known as oregano. Both varieties become much stronger in flavor when dried, so use with a light touch. It is said that the spicy sweet scent of marjoram was created by Aphrodite as a symbol of happiness. Both the ancient Greeks and Romans would crown bridal couples with wreaths of marjoram to symbolize love, honor and happiness. In Germany, marjoram was hung over the front door to protect against witches’ spells. Marjoram may be used in sausages, lamb, beef, pork, chicken, fish, tomato dishes, stuffings, breads, salad dressings, and chowders. Marjoram is used in Italian, French, North African, Middle Eastern, and American cuisines and spice blends such as bouquet garni, fines herbes, and sausage and pickle blends.